IBMA award nominated (that’s MASSIVE!! 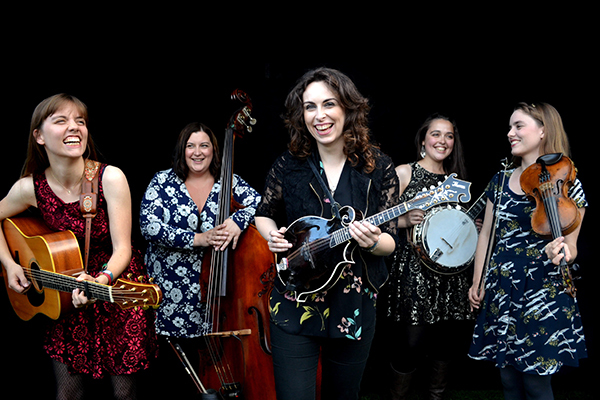 ), Anglo-Irish girl power bluegrass! Midnight Skyracer is a brand new all-female 5 piece bluegrass band playing hard driving traditional and modern classics and lesser known songs. Featuring an all-star lineup of some of the UK’s top instrumentalists and singers, the band takes inspiration from the likes of other great female artists such as Rhonda Vincent and Alison Krauss. Having taken the UK festival scene by storm in their first summer, the band are set to release their debut album, Fire, in February 2018 following that with some exciting festival dates and other touring. Leanne is a powerhouse singer and mandolin player. Some of her musical achievements to date include touring the world as lead fiddler with Essence of Irelandand, in 2011, recording her solo album with top session players in Nashville. More recently, Leanne has performed with London based bands such as the Ben Somers String Band and The Absentees. At just 18, Tabitha is the youngest member of the band and a bit of a banjo prodigy. Not only is she an incredibly talented banjo player, but she also has a beautiful, delicate singing voice. Tabitha can usually be heard performing with her two brothers in the Northern Ireland based band Cup O’Joe, with whom she has performed all over the world, including being the only UK band to ever perform on the IBMA World of Bluegrass Youth Stage in Raleigh, North Carolina. Laura splits her time in the band between the fiddle and dobro, contributing plenty of hot licks and soulful fills. Laura came second in the RockyGrass, Colorado fiddle contest in 2008 and once played fiddle with Tom Jones! Laura performs with her twin sister Charlotte in The Carrivick Sisters and also in the progressive bluegrass quartet, Cardboard Fox. Charlotte is one of the top female flatpickers in the world with an inventive lead style and and solid rhythm playing. Having grown up singing together, Charlotte and Laura’s sibling harmonies are second to none. Like Laura, Charlotte plays with Cardboard Fox and also in an old time duo (playing mandolin and clawhammer banjo as well as guitar) with fiddle Kieran Towers. Bluegrass bass players don’t come much better than Eleanor. Not only is she able to hold the band together with a simple, unobtrusive ‘less is more’ bass line, but given the chance she can bow it like a fiddle or take an impressive slap bass solo. Eleanor has played bass and fiddle in many UK bluegrass bands, currently fiddling with The Reckless Abandoners.